A real-life anti-Constitutional plot comes to light. Being stuffed with liberal Democrats, the Obama administration is hardly a friend to your Second Amendment right to keep and bear arms. However, our statist leaders have seemed too busy destroying our economy by regulatory fiat to mess with our guns. A stunning report from CBS, of all places, reveals this to be an illusion: Not only was our own government determined to restrict American gun ownership, it did so by fraud, deception, international crime, and even aiding and abetting murder. It's not news that Mexico is violence-ridden and crime-infested, with vicious druglords massacring the innocent and guilty alike without regard to their nationality. Our federal government having utterly failed in its responsibility to defend our border, this chaos unavoidably slops over into the United States. This is not really a new problem: a century ago, General John "Black Jack" Pershing spent several months pursuing Mexican revolutionary Pancho Villa across northern Mexico after Villa invaded the United States and burned Columbus, New Mexico. DHS [Department of Homeland Security] officials believe that the 87 percent statistic is misleading as the reference should include the number of weapons that could not be traced (i.e., out of approximately 30,000 weapons seized in Mexico, approximately 4,000 could be traced and 87 percent of those—3,480—originated in the United States.) Numerous problems with the data collection and sample population render this assertion as unreliable. So instead of 90% of Mexican criminals getting their guns from the United States, it's more like 10% - not nothing, but certainly we aren't the main problem. This is simple common sense: if you're a Mexican druglord, would you prefer to risk coming to America to buy heavily-regulated firearms in a hostile environment? Or would you rather just order up a container-load of unmarked Chinese weapons delivered to your door? The accompanying graph shows the obvious truth. Nevertheless, 3,480 guns are not trivial; where are they coming from? The Obama administration has claimed they're supplied by shady American gun dealers, and - surprise! - wants to make legal gun purchases by Americans more difficult in order to stop sales that are already illegal. Fortunately, the Republican budget blocks these efforts. Even if Mexican druglords were subsisting off American guns - which they're not - it would be a scandalous affront to restrict American freedoms simply because of foreign criminals. If our federal government would do its job of protecting the border, this wouldn't even be an issue: if our defenses stopped illegal immigrants going north, stopping illegal guns going south would be easy. The truth is far worse. American guns are going to Mexican druglords, not because shady American gun dealers provide them, but because the federal government supplies them. This isn't quite as insane as it sounds. If, like the ATF, you assume that Mexican druglords are getting their guns from America, it makes sense to let them get away with a couple. You use your spies and secret-squirrels to follow the gun through the chain and up to the druglord, then arrest everybody involved. 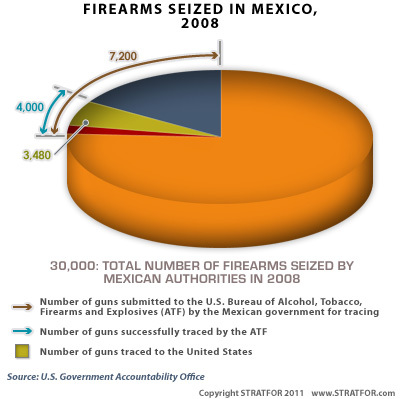 Remember, in the entire year of 2008, only 3,480 Mexican criminal guns were proven to come from America. In one month, our own government intentionally allowed 359 American guns to go to known Mexican criminal gangs. In other words, if March was typical, our government knowingly provided all American guns that Mexican druglords got - 359 x 12 months = 4308, well over the 3,480 found in 2008. Then, our same government blamed Americans for the Mexican bloodbath and attempted to use the Mexican murder rate as an excuse to strip us of our Constitutional rights - even while their own actions lead directly to the death of American law enforcement officers at the barrel of guns provided to criminals by... American law enforcement officials. When the CIA provided illegal weapons to our Iranian enemies during the 1980s, the media convulsed in horror, Congressional hearings were held, and people went down on felony charges though many were later pardoned. It would appear that the Obama administration has done almost exactly the same thing with the additional twists that a) Americans died as a direct result, and b) rather than take responsibility as did President Reagan, Mr. Obama tried to blame the American people and steal their freedoms. 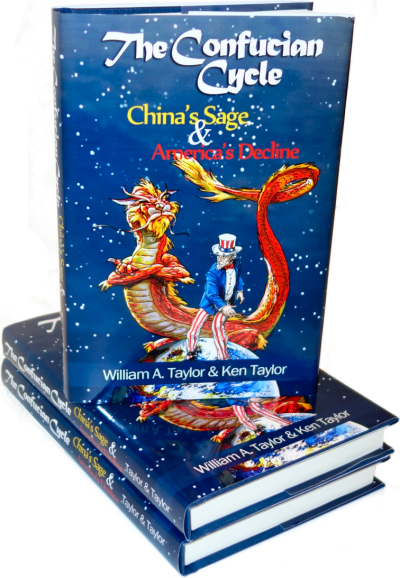 The only reason Reagan wasn't impeached over Iran-Contra was because there was no proof he knew that a legitimate diplomatic operation had degraded into an illegal arms-for-hostage deal, but every underling involved lost their jobs and wound up in court. To this day, the left sings that "Ronnie and Ollie were liars" even though they couldn't prove it. Where are the calls to find out what Obama knew and when he knew it - to say nothing of Eric Holder, the attorney general in charge of this murderous outrage? >To this day, the left sings that "Ronnie and Ollie were liars" even though they couldn't prove it. Oliver North was convicted in a federal court of lying. What more proof do you need? Ronnie certainly never was. As far as Ollie, well actually, looks like no he wasn't, at least not for long. "North's convictions were reversed. The Supreme Court declined to review the case. After further hearings on the immunity issue, Judge Gesell dismissed all charges against North on September 16, 1991, on the motion of the independent counsel." But he did admit to Congress to having lied previously. So, other than his own admission (which was inadmissible in court), no, they couldn't prove it apparently. Nice way to underscore Petrarch's point though - the left still cares about a scandal by people (mostly) long dead, but doesn't care about an even worse scandal going on right now. A court in fact found Oliver North guilty. The fact that the convictions were later vacated on a technicality by a higher court does not obviate the fact that a court did in fact find that North lied under oath. Petrarch's claim that that no one could prove that North lied is factually incorrect. That his legal conviction was later overturned does not change the fact that North lied. He himself admitted that he lied before Congress. What more proof do you need? Absolutely wrong. My pointing out the facts in US v. North in no way underscores Petrach's argument about what "the left" cares about for two reasons. 1) The facts are facts. Pointing them out does not make one a leftist, rightest, or centrist. 2) No one sane adult would mistake me for a leftist. In fact, it's fair to say that if anything I am hard right. Nothing I say has any bearing whatsoever on the cares and concerns of "the left." Was O.J. proven guilty? No he was not - he was acquitted. That has nothing to do with whether he was IN FACT guilty. But he wasn't proven to be. By definition, if after all appeals you are not convicted, you have not been proven guilty. Elementary criminal justice. Yes, of course Ollie lied - he admitted it. But that's the only "proof", and it's not admissible in court. Nobody here ever said he didn't lie, merely that his enemies couldn't prove it, which under the law is correct. Way to miss the entire point of the discussion by clinging to an irrelevant semantic debate point! NYT wants Obama to go after our guns. what credibility has he left? President Obama owes the country muscular White House leadership on gun control. More than two months after the killings in Tucson, Ariz., and some 2,400 American gun deaths later, President Obama has finally broken his silence on gun violence. In an op-ed article on Sunday in The Arizona Daily Star, Mr. Obama called on gun control and gun rights advocates to set aside their broader differences for now and support a worthwhile goal: fixing gaps in the National Instant Criminal Background Check System so that it would be harder for dangerous people to buy weapons. Mr. Obama said many state records on disqualifying involuntary commitments or criminal records are not being submitted to the federal background check system. He stressed the need for an “instant, accurate, comprehensive” system devoid of loopholes that allow dangerous people to avoid background checks altogether. He was alluding to the perilous exception for private sales by unlicensed sellers, including at gun shows. “If we’re serious about keeping guns away from someone who’s made up his mind to kill, then we can’t allow a situation where a responsible seller denies him a weapon at one store, but he effortlessly buys the same gun someplace else,” the president wrote. It was a promising start toward a sensible discussion of gun violence, even though the president stopped short of offering a specific legislative proposal or endorsing one already in the Congressional hopper. His to-do list omitted banning the big volume ammunition magazines that figured in the Tucson massacre and a long line of other mass shootings. The magazines have no defensible use outside of combat and law enforcement. Mr. Obama owes the country muscular White House leadership to make sure his reforms happen. Over the next two weeks, the Justice Department is planning to meet with people on different sides of the gun safety issue to seek consensus on possible legislative and administrative steps. A good starting point for those discussions is a new measure sponsored in Congress by two New York Democrats, Senator Charles Schumer and Representative Carolyn McCarthy. The legislation would withhold federal money from states that don’t submit the required reports to the national database that determines whether a would-be gun buyer is legally prohibited from purchasing a weapon. It would also close the gun show loophole. The National Rifle Association, to its lingering shame but to no one’s surprise, declined the administration’s invitation to talk — a sign of real disrespect for a president who has actually expanded gun rights. It also shows disdain for the well-being and safety of the public. A version of this editorial appeared in print on March 17, 2011, on page A34 of the New York edition. Headline is "Obama says he didn’t inform Mexico of U.S. gun smuggling operation because he didn’t know about it" which is what everyone will see. OK, fine, they didn't authorize it. But did they KNOW about it? They know about it now, obviously - when, exactly did they find out and what did they do then? Obama did say he wasn't informed either. He pointedly did not say that Holder wasn't. The United States drug market is the reason Mexican drug cartels buy arms. People buy drugs because they are miserable. The solution is to improve life is the US for people who feel they need drugs to get through the day. More social programs and less war. War hurts innocent prople and soldiers. What was the Justice Department thinking in steering guns into Mexico? The recklessness of federal officials in their harebrained scheme to assist in illegal gunrunning to Mexican drug cartels was laid bare in a scathing report by the Justice Department’s inspector general. Primary blame for the botched program — known as Operation Fast and Furious — was placed on a group of Arizona-based prosecutors and officials of the Bureau of Alcohol, Tobacco, Firearms and Explosives who lost track of hundreds of weapons that were allowed to pass into Mexico in hopes of tracing them to cartel leaders. But the report said there was no evidence that Attorney General Eric Holder Jr. knew of the risky operation until after it was shut down in 2011. While several high-ranking officials responsible for the fiasco have resigned or retired, the report recommended at least a dozen current Justice Department and A.T.F. officials for further investigation for possible disciplinary action. House Republicans, in a fiercely partisan confrontation with the Justice Department, foolishly cited Mr. Holder for contempt in June for resisting some of their demands for documents. They should have waited for the report, which confirmed some of their criticisms but exonerated Mr. Holder and found no evidence for bizarre allegations that Operation Fast and Furious was a scheme designed to justify tougher federal gun controls, not penetrate drug cartels. In fact, the operation was similar to a gun-trafficking program in 2006 run by officials in the Bush administration. Representative Darrell Issa, a Republican of California, remains firmly in pursuit of the administration, finding the report a vindication of hearings by his government oversight committee. Mr. Holder had better embrace the report as stark evidence for thorough repair of the department’s reputation. Something as half-baked as Operation Fast and Furious should never have been concocted in the name of law enforcement.